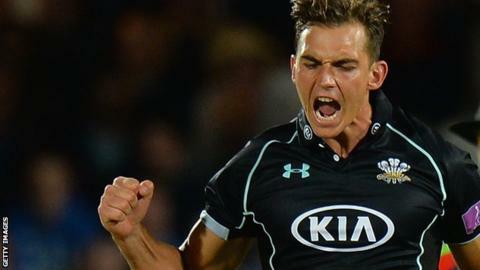 Surrey all-rounder James Burke has signed a new two-year contract. The 24-year-old has impressed during his first season at The Oval, having been signed from Somerset in September last year. "It's fantastic to secure a deal for the next two seasons and I look forward to what they might bring," he said. "Everyone at Surrey has made me feel very welcome and made my life very easy indeed. I hope to repay them with some good performances in the future." Burke is the latest player to commit his future to Surrey, with Jason Roy, Tom Curran, Ben Foakes, Zafar Ansari, Rory Burns and Matthew Dunn having recently signed new deals. "It's been good to see the progress that James has made this year and we're expecting more good things from him over the coming seasons," said the club's director of cricket Alec Stewart.